Register your children today for ballet technique, jazz, hip-hop, modern, tap, and liturgical dance with the award winning Northeast Performing Arts Group! 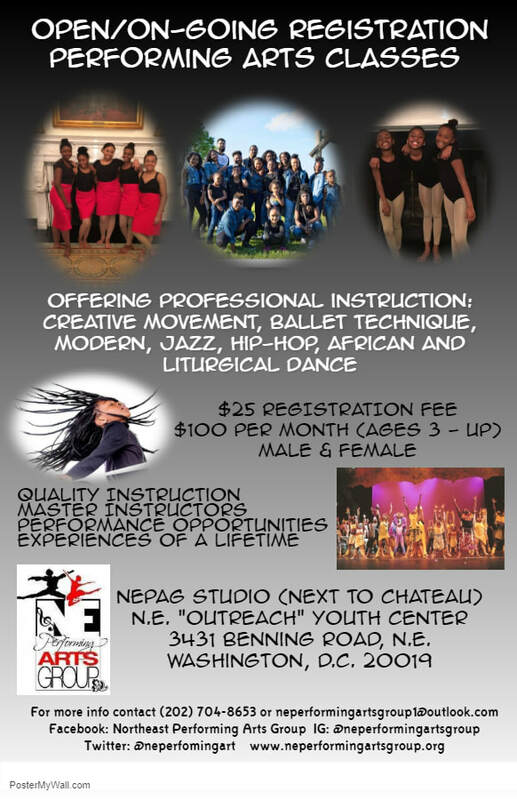 Students ages 3 - up will learn the fundamentals of ballet technique, modern, jazz, hip-hop, African and liturgical dance. Children enrolled in the year round program will have the opportunity to perform in three major productions, and perform in a host of events throughout the metropolitan area. Students enrolled in performing arts classes will receive first option in participating in NEPAG Summer Arts Camp.